This post was supposed to go up on the heels of last week's office update post, but got a little delayed over my excitement about being in a magazine (eek! still freaking out). So here we are today, picking back up where I left off last week! 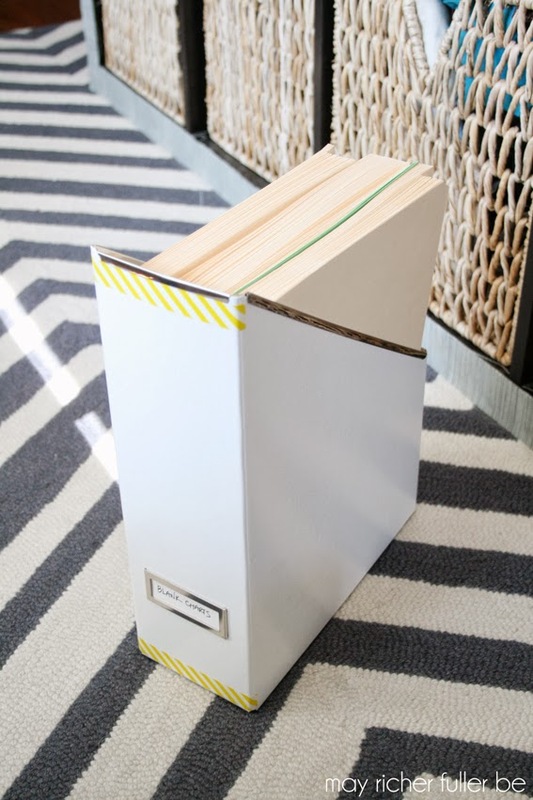 I showed you this photo of my "grasscloth" upholstered Expedit and talked about how these magazine files that are up on the top row of cubbies are my secret weapon when it comes to keeping the office organized. They used to actually hold magazines, but since I hadn't looked at a single one since I stored them there, I figured it was time to toss those into the recycling bin and find a new use for these guys. Turns out they're perfect for storing some miscellaneous office supplies that I need to have handy everyday, but that I don't want to have to see all the time - ya know what I mean? 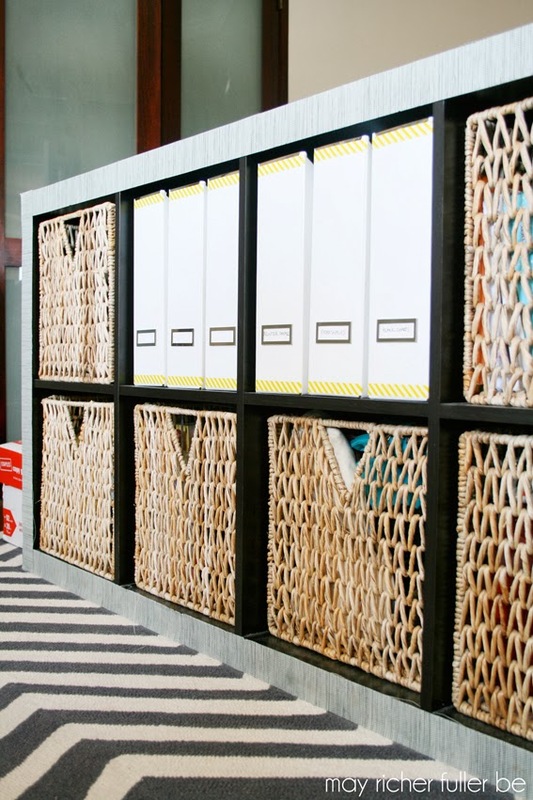 Concealed storage = less visual clutter. 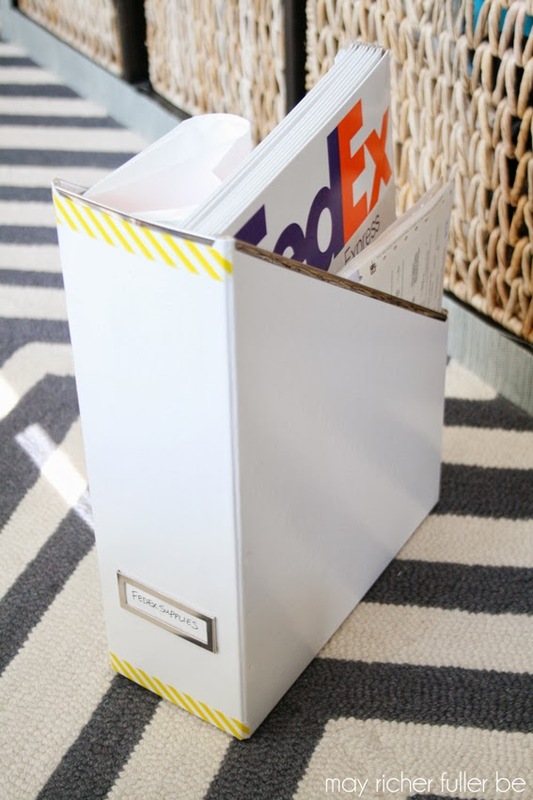 So if I'm not storing magazines in here, what am I storing? Well, in one I keep two reams of printer paper. I go through a lot of paper for my job (sorry environment! ), but since I'd rather not keep a big ole industrial-sized box of it out and visible, I keep two reams handy in one of the magazine files. When I finish one off, I replace it with another from the larger box. When my printer runs out of paper, it's really easy to reach behind me (since the Expedit sits behind my desk) and grab a stack to reload it. This is much more efficient than having to get up and retrieve the paper from the big box that's stored elsewhere in our apartment. 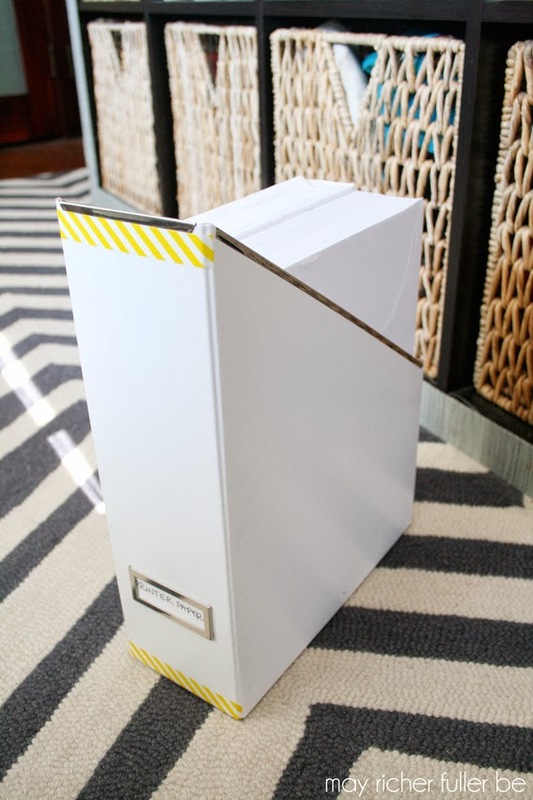 The second thing I store in one of these files is blank charts (manila folders). Just like a doctor's office, I have a chart for each patient I see. Similar to the printer paper, I've got a whole big box of these elsewhere, but it's much easier to keep a bunch nearby that I can easily grab on the fly when I need them. And lastly, working from home means that I've become BFFs with my FedEx Express man. I pretty much run a tiny FedEx Office out of my apartment since I have to ship stuff to my boss or our home office almost every day. It was driving me nuts not having a good, easy-to-access place for all my envelopes and shipping supplies when I first started working from home (picture shipping labels and tracking receipts scattered all over my desk area!). 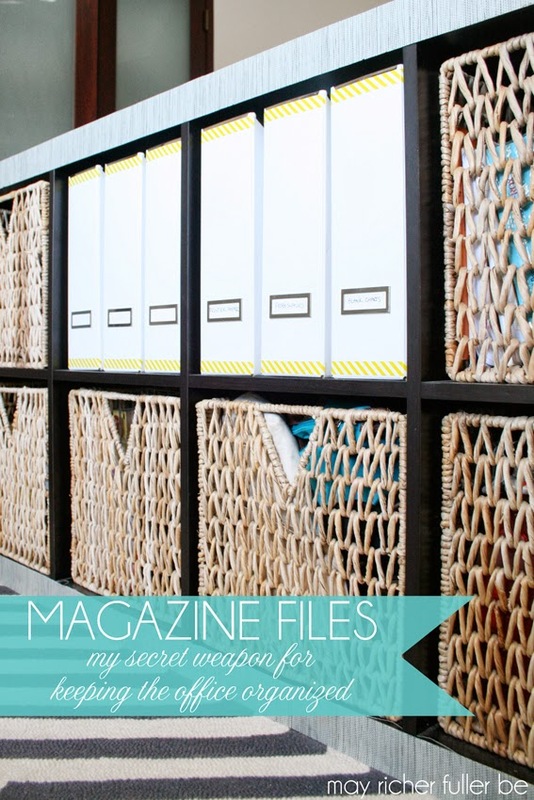 Then one day it hit me that I could store my supplies in one of the magazine files and voila! Problem solved. They're easy to pull out with one hand and grab what I need. Sometimes I even pull out a couple of them at a time and sit them on the floor next to my desk. At the end of the day, back they go into the Expedit, which helps me keep my work area clutter-free. Oh, and in case you were wondering, they used to be plain white, but I added a strip of white and yellow washi tape along the top and bottom to jazz 'em up a little bit. 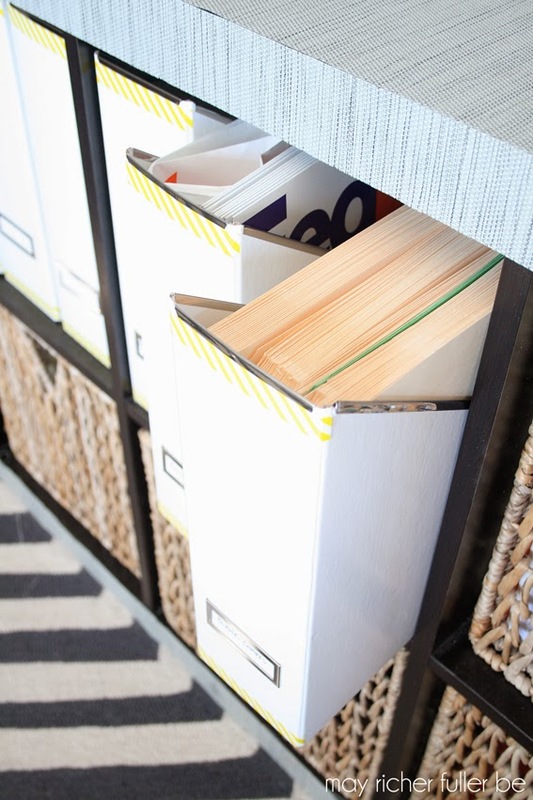 Using these magazine files for non-traditional purposes is one of my absolute favorite ways I've come up with to keep my home office organized. I even have three empty ones in the next door cubby that I'm figuring out how to make more useful for storage. Love having room to grow! Any of y'all use them not for magazines? So that's my secret weapon for keeping a crucial part of my home office organized and improving my workflow. 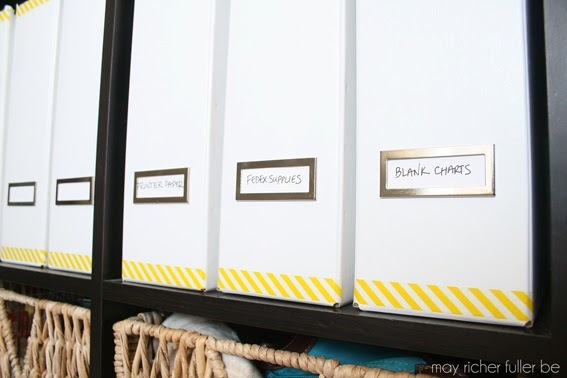 Do you have any secret weapons for keeping your home office organized? I'm totally stealing these brilliant ideas! Thanks for sharing! !